Kitchen & Bath Design News annually highlights 50 top innovators throughout the industry whose work, creative talents, business acumen and professionalism are currently leading the way for the industry and elevating the kitchen and bath trade. Twelve Stones Designs’ own Christy Bowen, CKBD, UDCP, was honored among this year’s named innovators. View the complete list of this year’s innovators in the online copy of the October 2018 Kitchen & Bath Design News. All 2018 Regional winners were honored at the Evening of Excellence that was held on April 20, 2018 in Charlotte, North Carolina. Winners were selected anonymously by an impartial panel of judges who are experts from within the industry. Twelve Stones Designs along with partner Adams Company have been named the KBDA 2017 Silver Winner for Master Bath Under $50,000. Christy M. Bowen, CKBD from Twelve Stones Designs in Austin, Texas recently earned the designation of Universal Design Certified Professional (UDCP) from the National Association of the Remodeling Industry, (NARI). A Universal Design Certified Professional (UDCP) designation proves the designer's superior knowledge, technical comprehension and skill in principles attractive not only to those who wish to age-in-place but also families with special needs and families that are forward thinking. A UDCP proves knowledge in the seven principles of Universal Design, how to interview clients with an understanding and consideration of their special needs, and finally the how-to of building these projects. "I am thrilled to be part of an elite group of designers and remodelers who specialize in universal design. Design that is relevant and functional not only for today's society but addresses the needs for the future without stigma or discrimination" says Christy. NARI’s UDCP program measures skill and expertise valued not only by other professional remodelers, but by consumers as well. Highly respected by those who have achieved the designation, the UDCP program identifies professional designers who have undergone comprehensive review and testing in areas of universal design/remodeling. In addition, they must also adhere to NARI’s strict Standards of Practice and Code of Ethics. NARI is a professional association whose members voluntarily subscribe to a strict code of ethics. Consumers may wish to search www.RemodelToday.com to find a qualified professional who is a member of NARI. Twelve Stones Designs along with partner Realty Restoration, LLC have been named as team winners of the 2017 Chrysalis National Award for Kitchen Remodel Over $150K. Yet another breathtaking whole house remodel/addition produced by award winning Design+Build Trifecta, Twelve Stones Designs and Realty Restoration, LLC, garnered interest from many Austinites at this year’s Austin NARI’s 13th Annual Tour of Remodeled Homes. It won the coveted “People's Choice” Award at the Austin NARI Evening of Excellence in November of 2015 along with several local and regional NARI Contractor of the Year awards. An article on this impressive and expansive project was featured in the November 2015 Urban Home of Austin Magazine. Check out the stunning pictures and story on this rare project. Twelve Stones Designs and design +build team, Realty Restoration, LLC, were featured in an article showcasing another remarkable whole house remodel in the Fall/Winter 2015 edition of Symmetry Magazine. This whole house transformation won the highly esteemed Austin NARI Tour of Remodeled Homes 13th Annual “ Judges' Choice” Award at the Austin NARI Evening of Excellence in November of 2015 along with several local and regional NARI Contractor of the Year awards. Be sure to read this article on how this time capsule of a house was transformed into a new millennial dream home. Proprietor of Twelve Stones Designs, Christy M Bowen, CKD, CBD, contributed to this fascinating article on the evolution of transitional design over the last decade in the June 2015 issue of Kitchen & Bath Design News. Featured in this article are photos from her award-winning transitional kitchen from the 2014 Thermador Kitchen Design Contest. Read the full article here. We are pleased to announce that Twelve Stones Designs has been awarded the Houzz Influencer Badge. This badge is only given to professionals whose advice and knowledgeable posts are most appreciated by the Houzz community. Follow Twelve Stones Designs on Houzz to see what we're saying. We are honored to announce that Twelve Stones Designs has been awarded the Houzz Recommended Badge. This badge is awarded to the top-rated pros on Houzz. Be sure to check out our profile on Houzz for even more great pictures from our award-winning designs. Twelve Stones Designs of Austin, Texas has been awarded “Best Of Houzz” for Design by Houzz, the leading platform for home remodeling and design. The national award winning Design Studio was chosen by the more than 25 million monthly unique users that comprise the Houzz community from among more than 500,000 active home building, remodeling and design industry professionals. Read the full press release. Twelve Stones Designs along with Design+Build Team, Realty Restoration, LLC, reinvent another kitchen; transforming this dungeon-like space into a shining, brilliant jewel! Read the full article brought to you by K+BB. 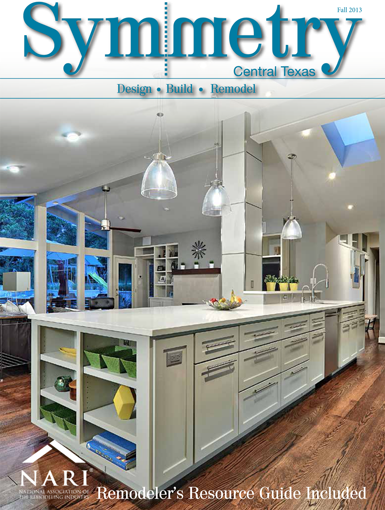 In the August 16, 2014 issue of the Austin American-Statesman, Nicole Villalpando's article Plan a new kitchen But know trends and pitfalls first discusses multiple design concepts and trends, and includes a section on one of Twelve Stones Designs' projects. Twelve Stones Designs and trifecta design+build team, Realty Restoration, LLC, were featured in Qualified Remodeler’s Top 500 of 2014 issue. Twelve Stones Designs is proud to be featured in the Design a Spectacular Bath on Any Budget article in the Spring 2014 issue of Custom: a home plan portfolio. Twelve Stones Designs has been voted by the Houzz community as a winner of their Best of Houzz 2014 awards! PROFESSIONAL REMODELER MAGAZINE SHOWCASES TWELVE STONES DESIGNS KITCHEN ON FRONT COVER, JANUARY 2014. Twelve Stones Designs is pleased to be the featured cover of Professional Remodeler issue January 2014! Christy provides a professional's point of view on choosing a sink in this article from Symmetry Magazine. Twelve Stones Designs is featured in the December issue of Kitchen and Bath Business highlighting a stunning bathroom done in conjunction with Realty Restoration. This master bath has become an oasis for the Lady of the house. Twelve Stones Designs and Realty Restoration are featured in Kitchen and Bath Business magazine showcasing a design that blends a living area and kitchen with an eclectic mix. The line between a kitchen and a living space faded in Realty Restoration’s kitchen redesign for an artistic mother and her three daughters. 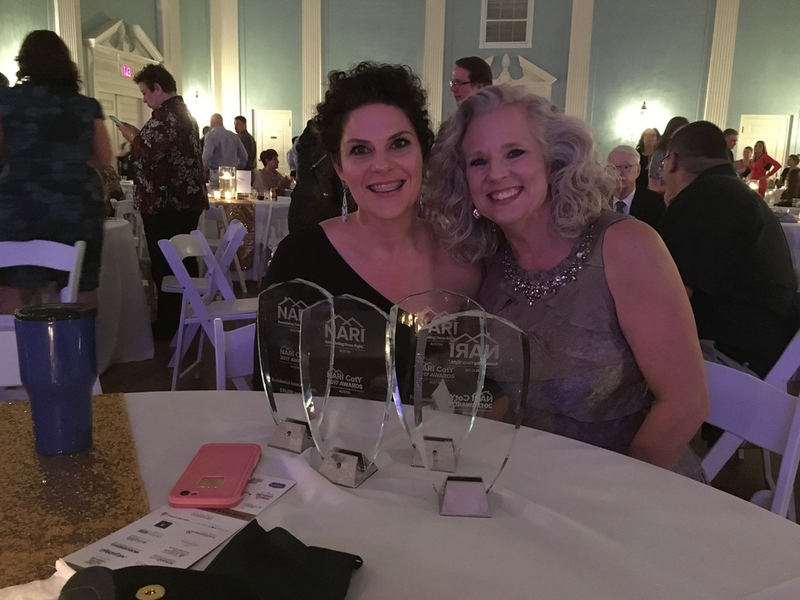 Christy M. Bowen of Twelve Stones Designs announced that she has earned certification as a Certified Bath Designer (CBD) from the National Kitchen & Bath Association (NKBA), the leading trade association for the kitchen and bath industry. The National Association of the Remodeling Industry (NARI) named Realty Restoration, LLC of Austin, TX, in conjunction with Twelve Stones Designs 2013 National Contractor of the Year (CotY) in the Residential Kitchen over $120,000 category of its annual awards competition. Christy along with David Davidson and Christopher Davidson of Realty Restoration discuss important considerations for choosing the right team to help you with your next project. Christy shares her thoughts on the coming year's color palette trends in home décor. Christy M. Bowen announces her certification as a Certified Kitchen Designer (CKD) from the National Kitchen & Bath Association (NKBA), the leading trade association for the kitchen and bath industry.